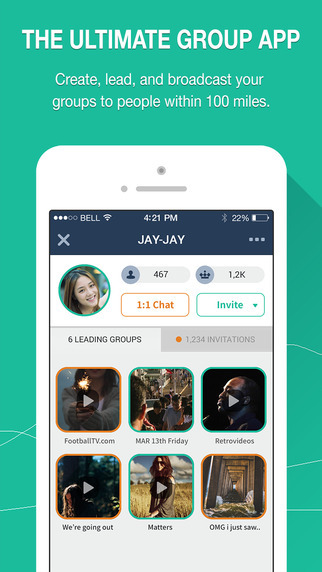 WeHub is an interesting chat app which allows its users to create 1:1 and group chats with extreme ease. Using this app, users can also connect with people they meet in person and keep in touch without sharing any private information such as a last name, email, or even phone number. WeHub supports various communication mediums ranging from text, videos, and photos, to self-destructing messages. Sending a video is as quick and spontaneous as holding down the media button and confirming the video before it is sent. Text messages are just as quick and simple, but they have their own features which allow messages to be bolded, have letters randomly scrambled, or set a self-destruct time. One of the most interesting features with this app, in my personal opinion, is the ability to recall messages before the other party reads them. I have not seen such a feature anywhere else, which is surprising considering that the idea is a very simple one: undo a message someone has not yet read, that you don’t want them to anymore or that they no longer need to read. How many times have you texted your friend “where are you?” only for them to later open the text and spend time reading it when they could spending it more productively? If that hasn’t happened to you, then I’ll let you know it’s happened to me many times. Because of it, I am definitely nodding my admiration of this feature towards the developing team. In addition to being able to connect with your contacts and people nearby, WeHub also makes it easy to meet new people in your area. You can even use the search feature at the top of the app to find other people that are into the same activities you enjoy. Above you can see the instant group chat. The person that will lead the group simply drags their icon to the lead zone, while the person(s) who will join drag their icon to the join zone. Within a few brief moments everyone will have been connected and they can stay in touch indefinitely, even if they move out of the physical range that they met within. WeHub also has profile pages which can be used to invite users, friend request, or open a current chat you may be having with them. WeHub knocks the ball out of the park as a spontaneous communication app. It’s not only easy and quick to communicate, but also to connect, which makes this app a must-have for friends, family, and business people alike. It was not clear at first to me that it’s possible to send text messages by tapping what was only introduced in the app as an icon that is to be held to create videos. Furthermore, after a video is complete, the only way to send it is by hitting “Next” on the preview page of the video. “Next” does not clearly indicate that a simple tap will send the video. “Send,” therefore, would be much more accurate. WeHub is a free must-have communication app. It mixes the best of communication features many have come to rely on, such as read receipts and the ability to send various forms of media, but also brings something new to the table with its patented Instant Group as well as “recall” message feature.